I'm sorry that I ruined your lives and crammed eleven cookies in the VCR. 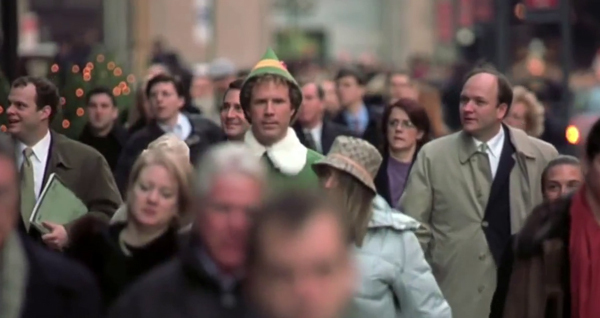 (SPOILERS) Much as Jon Favreau deserves plaudits for making Iron Man’s success look easy, his achievement with Elf was even more unlikely. A Christmas movie that manages to be sincere without also being mushy, a comedy that’s incredibly silly but doesn’t stray from the point (as Will Ferrell movies have a tendency to do, God bless his freewheeling improv) and a romance that kindles even though composed largely of bullet points (thanks enormously to Zooey Deschanel’s patented manic elfie dream girl). Buddy: Ow! Son of a nutcracker! Favreau came to the material, which had been knocking around for about a decade, with a clear set of ideas. He rewrote the David Berenbaum (The Haunted Mansion, The Spiderwick Chronicles, er, Lucas’ Strange Magic) screenplay, pushing its darker tone down from PG-13 to PG, making Buddy a lighter character en route. He also embraced practical effects, desirous of evoking the aesthetic of TV Christmas specials of yesteryear, complete with the seams showing. 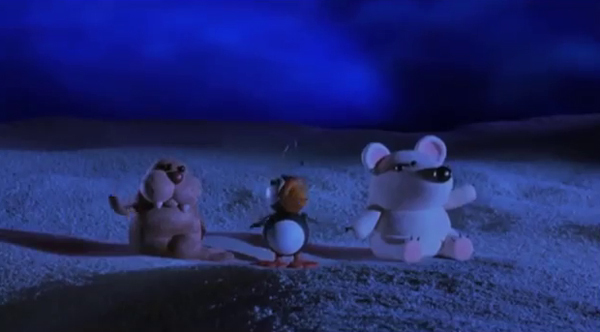 So, forced perspective was used for the North Pole, along with the bewilderingly perfect decision to use stop motion animation. CGI was largely eschewed, Favreau claiming it was only used for snow (although I’d hazard the Santa’s sleigh sequences required some degree of compositing). 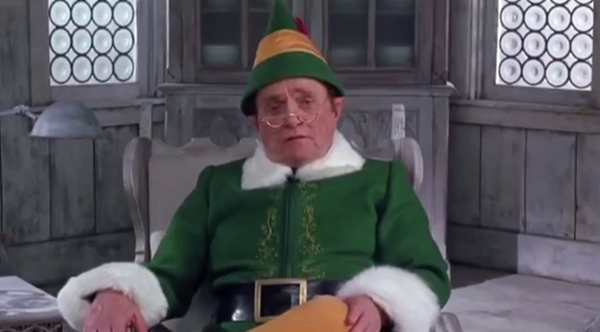 He also brought with him an evident willingness to use the older generation of comedy (TV) legends, with Ed Asner and Bob Newhart bringing a winningly inclusive vibe as Santa and Papa Elf respectively. The latter’s deadpan narration is the perfect scene-setter, detailing his adopted son’s appearance at the Pole (via Saint Nick) and the decision to utilise the services of elves in present production (gnomes drank too much and trolls weren’t toilet trained). 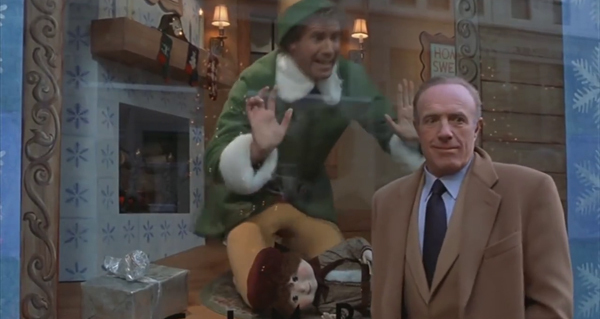 Buddy: I’m a cotton-headed ninny-muggins! The tester for a movie like this is how well the supporting cast play off the comedian lead, though. Will Ferrell’s idiot man-child shtick is a lot more guileless and endearing than many (Adam Sandler, for example), and one couldn’t imagine the prevailing innocence carrying with Jim Carrey in the role (he turned it down, although he did later star with Deschanel in The Yes Man). Indeed, while Carrey has a tendency to overwhelm his movies, Ferrell can almost disappear into them at times (you can’t imagine Carrey in a Woody Allen film). 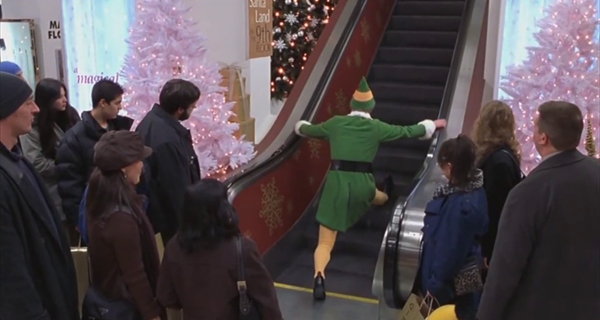 So there’s an inevitable gamut of excruciating idiot moments, as adult Buddy fails to realise he’s human, continuing to perch on Papa Elf’s knee as if he’s a fraction of size, arrives in New York (complete with Tootsie-esque crowd shot) and pays attention to some instructions (“Don’t eat the yellow snow”) but ignores others (picking discarded gum off railings and eating it), an entirely predictable escalator gag and much food-based humour (including a truly impressive belch, albeit not supplied by Ferrell himself). The biggest wins, however, come from interactions with others failing to appreciate Buddy’s unique perspective. Manager: Hey! There’s no singing in the North Pole! 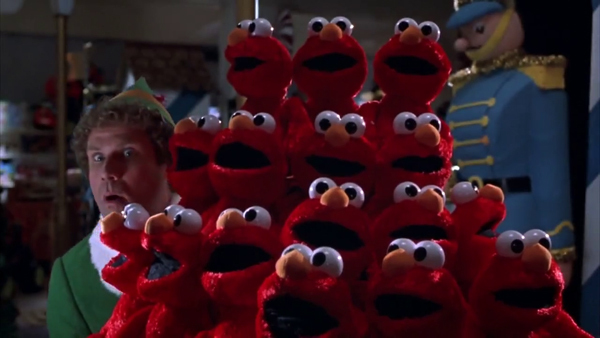 Mistaken for an employee of Gimbel’s department store, Buddy proceeds to stress out the manager (Faizon Love) with a frenzy of secret overnight decoration in anticipation of Santa’s visit the next day, but is most disappointed to discover – in a nod to Miracle on 34th Street – that Santa is a disreputable fake. Ferrell’s improvised indignation unsurprisingly carries a not dissimilar tone to berserk putdown metaphors in Anchorman (“You sit on a throne of lies!”; “You stink!”; “You smell like beef and cheese, you don’t smell like Santa”). Later, drunk on what he thinks is maple syrup added to his coffee but is in fact alcohol, he makes a new friend (Mark Acheson, only 26) in his father’s publishing firm’s mailroom and ends up breakdancing. Buddy: I didn’t know you had elves here. 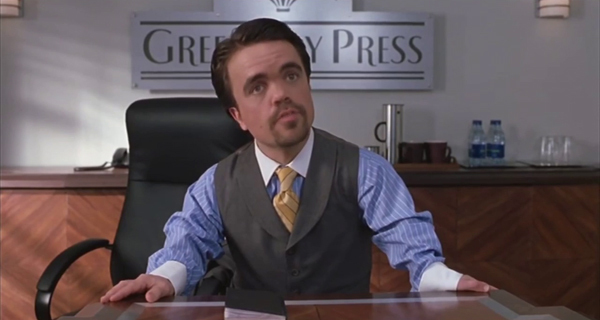 The most uproarious of his encounters is Elf’s most legendary scene, as Buddy happens upon the now ultra-famous Peter Dinklage (as children’s author Miles Finch, willing to sell a few ideas for cash-in-hand payments) and marvels at his familiarly diminutive stature, to the horrified embarrassment of all concerned, except for Dinklage, who is simply livid (“He’s an angry elf”) and proceeds to start beating on Buddy (“Call me an elf one more time”; “You’re an elf”). As with all the best moments here, they rely on Ferrell’s co-stars playing it dead straight in response to his lunacy (“He must be a South Pole elf”). Buddy: I can’t go to sleep unless you tuck me in. 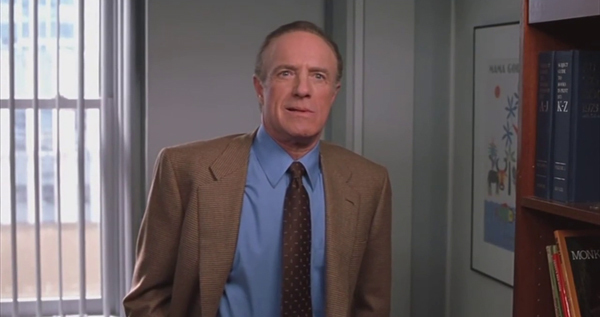 In this regard, even more essential is the actor cast as Buddy’s self-absorbed, not-exactly-Scrooge-like-but-still-on-Santa’s-Naughty-List father Walter Hobbs, and the biggest compliment you can pay James Caan is that the entire interaction between Walter and Buddy seems designed to provoke Caan the person rather than Hobbs the character. When Ferrell tries to hold hands with him, or when Buddy asks Walter to tuck him in at night, you can only conclude it’s playing with fire casting Caan. The actor apparently took a while to thaw out, but Favreau attested to his sense of humour and that, once he got with it, he was a lot of fun (Ferrell wrote him a note as wrap gift, invoking his most famous role: “The first one is a little bit slow, but the second two are really good”); he evidently has something of a knack for these comedies of deadpan hard man reacting to frivolous opposites, as he also got on with Hugh Grant on Mickey Blue Eyes (“He decided quite early that I was an English wimp, and he’s been giving me hell for it ever since”). It seems Caan was on the verge of cracking up during Buddy’s blood test scene, so had to turn away when Buddy screamed. Crucially, he also brings genuineness when it counts (“Don’t tell my son what to do” of his younger son, standing up to his boss). Is singing loud for all to hear. Inevitably, the female parts aren’t as rewarding. Mary Steenburgen only has to walk into a room to seem like the nicest mom ever, while Zooey’s comedic skills are mostly thrown into the sharp relief of staring indulgently at Ferrell with those enormous eyes (which is more than enough). She also gets to sing, something Favreau added when he found she had a talent and which adds a certain something to the Central Park finale. 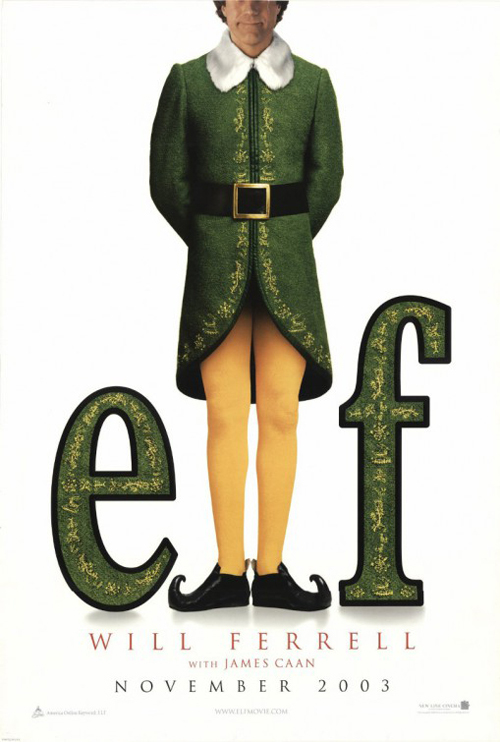 If the setup of Elf is passingly similar to Santa Claus: The Movie (“elf” leaves the North Pole to find his own way, arrives in New York and eventually reunites with Santa), this is as entirely well apportioned as that movie was misconceived. Even the platitudes (“Christmas spirit is about believing, not seeing”) land thanks to Favreau’s light touch. He’s also mercifully aware that, when it comes to comedy, two hours is usually much too much. At least he was; Chef’s biggest problem is that it’s about half an hour too long. 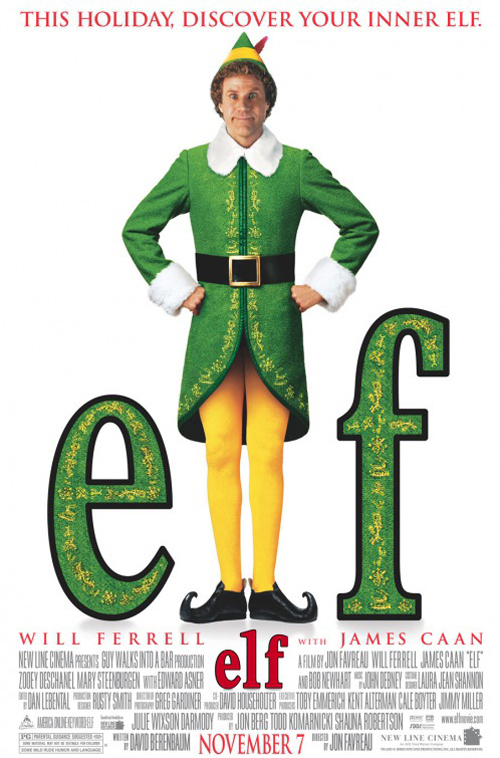 Elf rightly attained its status as a Christmas perennial very quickly, offering that elusively perfect mixture of sentiment and insanity. In fact, you’ve probably just watched it again.